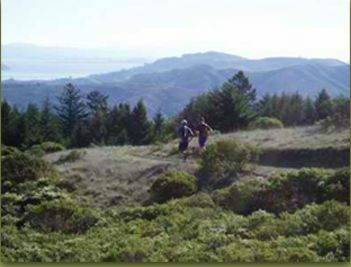 These trails are a coastal jewel nestled between the Santa Cruz Mountains and foothills of Pacifica. It offers diverse coastal vegetation, year-round creeks, and a 150' waterfall. Enjoy views of meadows, eucalyptus groves, wildflowers , steep ridges and hillside grasslands. On clear days enjoy vistas of the Pacific Ocean, San Francisco and Marin County. The ocean provides cooler air for a fast, fun run through one of the most bio-diverse and pristine coastal parks in California.